Summer of '71 by Helen Reddy may be my favorite drug reference in popular music simply because it is so unexpected. When Clapton sings about cocaine, no big deal. 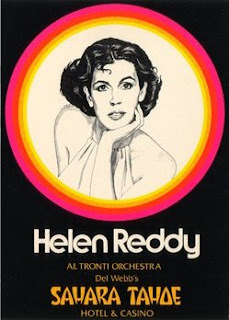 But when Helen Reddy sings about mescaline, I pay attention. Puff the Magic Dragon used to be a favorite, but Snopes ruined it for me by casting doubt on there actually being a drug reference. According to the Snopes article, this is a patent urban legend, but with lyrics like "little jackie paper loved that rascal puff" I have a feeling that legend is going to be a hard one to dispell. I Get a Kick Out of You by Cole Porter is another great one because of its age. Although, cocaine was even in soft drinks back then (i.e. Coca-Cola), so maybe it's not that impressive. Still, the wonderful rendition in Mel Brooks' Blazing Saddles is reason enough to like it. Some they may go for cocaine. I'm sure that if, I took even one sniff it would bore me terrifically too, but I get a kick out of you.